I’ve been a gardener for more than a decade. My property started with ragged blotch of dying grass, and over time, I transformed it into a verdant paradise filled with sweet-smelling fruit trees, prolific vegetable patches, and planters overflowing with gorgeous blooms. I knew everything about the soil in my yard; I understood the climate better than the local meteorologist; and now I’m moving away to a place with completely foreign dirt and weather. After some research, I’ve found that my new yard’s soil is compacted clay filled with rocks, and the air is too dry for most of my usual flora. Worse, for half of the year, the sky is interminably bright — and the other half is nearly pitch-black. Because my new yard is hardly as conducive to my typical gardening tips and tricks as the old one, I’ve decided to try my hand at greenhouse gardening. Here’s the story of my journey into the greenhouse. No two gardener’s greenhouses are exactly alike. The size, style, systems, and amenities will vary depending on a gardener’s choice of crops, yield demand, manpower, and budget, among other vital factors. Here’s what I determined would work best for my gardening interests and needs. 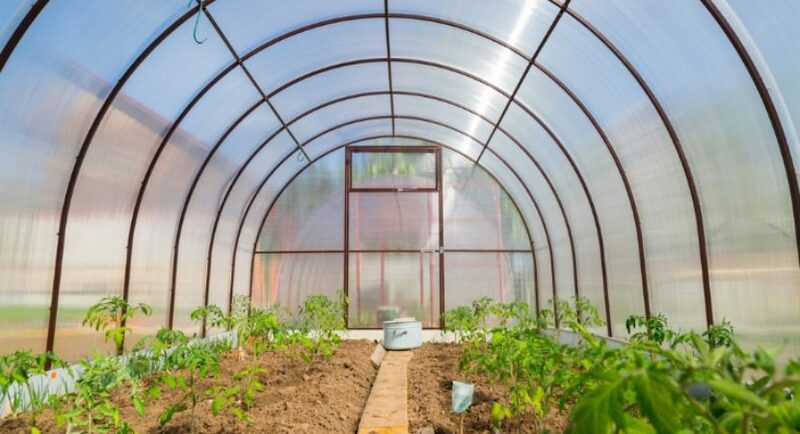 While I would advocate that beginner gardeners start with a smaller greenhouse experiment, like a greenhouse box or small shed, I jumped head-first into greenhouse gardening with a 30-foot-long, 10-foot-wide round-top. On one hand, I have enough space to grow almost anything and everything; on the other hand, that much space pushes the boundaries of what I can tend by myself. One feature I found critical was shades to block out sunlight as necessary to encourage growth. Many gardeners mistakenly believe that the more sunlight crops get, the bigger they grow, but in truth, plants require periods of dormancy just like animals. My light dep greenhouse produces the healthiest crops because I can give my plants a much-needed rest. By design, a greenhouse seals its interior against the outside world to protect its crops. However, this can be detrimental, especially in the area I now live. Temperatures vary wildly from summer to winter, so a greenhouse is essential for protecting my crops during the cold months — but come May and June, my greenhouse could bake my precious plants. My temperature control system consists of an evaporative cooler as well as a series of fans, which can keep my plants cool. However, if I were in a colder climate, I might also install a heater. Being separated from the sky and earth also has impacts on my crops’ moisture levels. For one, it prevents natural water from flowing into the soil and nourishing the plants. For another, it encourages the buildup of humidity, which can stifle plants and cause unwanted growths, like mildew and mold. I can roll up the exterior covering of my greenhouse, giving me getter control over the moisture in the air. Though I opted out of a sprinkler system for now — choosing instead to manually water my plants — I may install a smart watering system in the future. Wood. DIY-ers are most likely to build wooden greenhouses because wood is easiest to cut and assemble. However, wood requires extensive attention and care to prevent outbreaks of mold, mildew, or disease. Resin. Perhaps the best insulating frame, resin is becoming more popular among gardeners. Still, it has a propensity to warp in light and heat, which could destroy the greenhouse. Aluminum. Inexpensive, resistant to rust, and easy to assemble, aluminum would be ideal — if it wasn’t a terrible insulator. PVC. My first choice as a framing material, PVC is a better insulator than aluminum and easier to work with in hoop houses, like mine. Also called glazing, the windows of a greenhouse are critical because they must let in light and heat without letting them escape back into the environment. Glass. Though glass is the most aesthetically pleasing, it is prohibitively expensive. Typically, true gardeners aren’t terribly interested in using glass glazing. Polycarbonate. Extremely durable, amazingly insulative, and mercifully affordable, polycarb is the most popular greenhouse glazing material. Poly film. I chose poly film rather than poly carb because insulation from cold was not my primary intent. Both less insulative and less expensive, I found film better for my warm-climate needs.